Enjoy the beautiful views of New Orleans on a nearly 2 hour scenic walking tour of the French Quarter. With a small group guaranteed(less than 15 ppl), this walking tour provides a more intimate experience as your stroll from the Jackson Brewery Building to St. Louis #1 cemetery. Your tour guide will teach you the different styles of architecture as well as share some of New Orleans most famous history. Explore the streets of the French Quarter much like Jean Lafitte and Tennessy Williams did. Marvel at the many styles of architecture still present today after 300 years of history. Meet up with your guide in the heart of the French Quarter at the Jackson Brewery Building to begin your tour. Start out by admiring the differences between Spanish and European architecture as your guide shares stories of New Orleans past. Learn about the Cabildo and the Presbytere as well as the history behind the St Louis Cathedral. 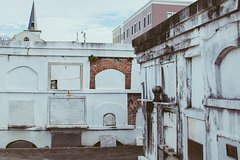 Walk your way through the Quarter by Royal street and Bourbon Street until you reach St. Louis Cemetery No. 1. New Orleans cemeteries have tombs built above ground due to our high water table. Many famous people have been buried here including voodoo priestess Marie Laveau.